Camping out in an off-road caravan can be a fulfilling pursuit. Off-road caravans open up a whole new world for people to see. As you head off the beaten track you’ll find untouched scenery and lakes and waterfalls that are not over-populated with tourists. It’s an amazing feeling to pull up near a tranquil stream and stop to enjoy the serenity of it for the night, knowing that tomorrow you will be able to move on to a stunning gorge or a hidden forest. To access those outback roads, you’ll need to find good off-road caravans. Standard trailers simply aren’t up to the job. This guide will help you to find the best caravan for your off-road needs. Strong Suspension: Rickety roads will put a lot of stress on your caravan. The best kinds of suspension are independent suspension or load-sharing. The independent design will cancel out the harmonic motion that tends to happen when driving on corrugated roads. In contrast, load-sharing suspension reduces shock when you run into obstacles, transferring the energy between the two sets of wheels. Coupling: standard couplings are designed for smooth roads, and when you drive off-road the coupling will take a lot of punishment. That’s why off-road caravans need to have a stronger coupling that is designed to cope with the angular demands that driving off-road will put on them. Braking: Electric drum brakes are designed to cope with frequent breaking. They are less susceptible to vibration wear and tear, and they can cope better when under the high temperatures that are associated with heavy breaking. Another thing you need to look for is a robust, quality interior. In general, most caravans will be fairly similar inside, but off-road caravans need to have stronger fittings and better finishes. Look for fittings that are secured properly – not merely stapled or glued in place. Make sure that the cupboards and drawers latch shut so that if you bounce around on a rough road they won’t fly open. When it comes to the outside of the caravan, you’ll want something that is strong and that is not likely to scratch or dent too easily. Aluminium checker plates or powder-coated steel ‘armor’ around the bottom half of the van will stop most of the damage. You will also want a stone guard mounted to the front of the van, that will help to deflect any stray rocks or gravel, absorbing some of the impacts so that the stones don’t bounce back towards your vehicle. Any seals will need to be watertight, and made from high-quality materials so as to not let any fine dust into the seals. A basic, robust caravan for off-road use doesn’t have to cost the earth, but if you’re willing to spend a little extra you can get some great bonuses that will help to make your trips that little bit nicer. Stability enhancers, water storage, solar panels, upgraded tires, and communication options are all available and can make your trip more enjoyable. You might also want to think about the type of frame that your caravan is made from. There are timber frames and aluminum frames. Timber is light, cheap, and generally very stable. It is not susceptible to corrosion or electrolysis issues. The downside is that it’s important that the frame is constructed properly, not just stapled together. In addition, it can rot if it gets wet, so it is vital that all leaks are fixed promptly. Regular maintenance is a must. In contrast, aluminium is a similar weight to timber, and it is less susceptible to rot. It can be joined through punched pins, rivets, or welding. It is important that whatever construction is used is strong enough to handle the punishment that the structure will get when off-road. Thin welds may not be up to the job for example. 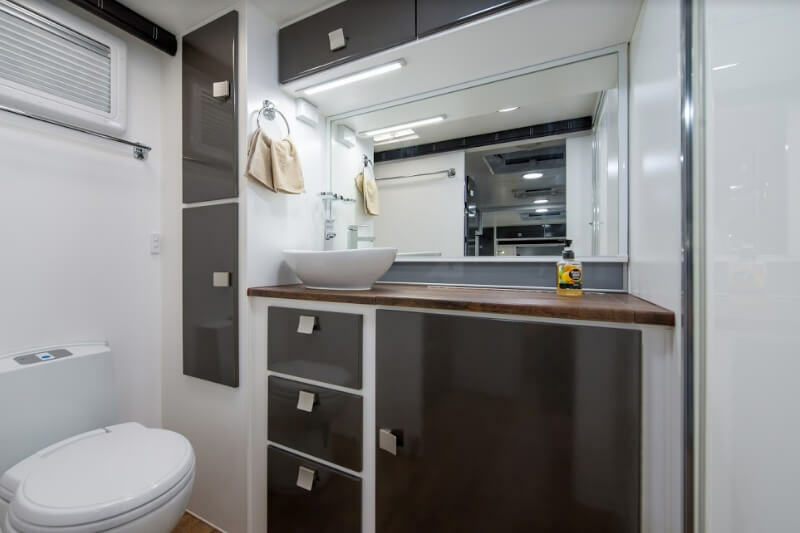 There are some caravan manufacturers that are trying a new composite structure that does not require a frame, but these, at the moment, are still quite expensive. They are very light and offer greater strength, but making sure that the pieces join together in a way that is water-tight, and strong, requires some expertise and specialist equipment, so only higher-end manufacturers are offering composite bodies on their off-road options. Moulded fibreglass is another option that is becoming increasingly common, but the quality can vary massively from company to company. In theory, this construction method is versatile and strong, but in practice, a lot of manufacturers have issues with waterproofing or find that the bodies are too delicate. If you’re considering a caravan with this kind of body, be sure to read lots of reviews and off-road tests from independent third parties before you commit to the purchase.